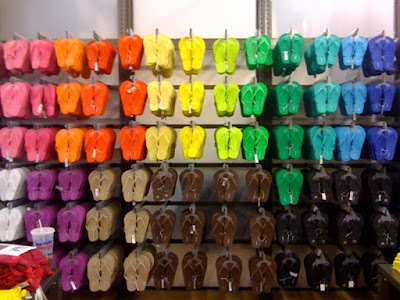 :: Buy your flip-flops early for full price and take your receipt in on Saturday for a price-match and refund. I checked with a manager today in the Clackamas store. She was less than thrilled, but did confirm that they would match the price. I am planning to get there in the early afternoon after the huge rush. :: If you want to brave the crowd but can’t find the right colors or sizes, just buy any flip-flop in the correct section (women’s, men’s, kids) and exchange them later in the week when they are restocked. Honestly, the regular price isn’t too bad (2/$5) so missing this sale isn’t going to break the bank. Last year a the Lloyd Center this sale did not include childrens flip flops!!!! Love the buuying them before the sale idea … too bad we live so far from the mall as I’d probably not make it back! i was talking with a friend who went to the sale last year. she said that the old navy at gresham station was SOLD OUT of the flip flops in the first thirty minutes…so you really do have to get there EARLY if you want in on this deal! !